Isaac, the son whom Sarah bore to Abraham in the hundredth year of his age, was born around 1897 B.C. In his infancy he became the object of his half brother, Ishmael's, jealousy. And in his youth he was the victim, in intention, of Abrahams's great sacrificial act of faith. The Isaac Bible story continues when he was forty years old and married Rebekah, his cousin, by whom, when he was sixty, he had two sons, Esau and Jacob. Driven by famine to Gerar, he acquired great wealth by his flocks, but was repeatedly dispossessed by the Philistines of the wells which he sunk at convenient stations. 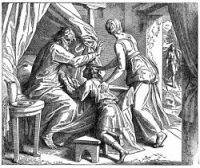 After the deceit by which Jacob acquired his father's blessing, Isaac sent his son to seek a wife in Padan-aram. All that we know of him during the last forty-three years of his life is that he saw that son, with a large and prosperous family, return to him at Hebron before he died there at the age of 180 years. He was buried by his two sons in the cave of Machpelah. These Isaac Bible drawings are from my collection of antique books. Feel free to use these Isaac Bible illustrations in your artwork. Click on the Isaac Bible pictures below to see more details about saving a free image from Isaac of the Bible or about purchasing the Isaac Bible images at a higher resolution.